An iconic new master planned Richmond real estate development is taking shape right now! Richmond ViewStar condos are located in Capstan Village where you will live in the heart of it all. This modern community hub will allow you to live, work, play, shop and relax right here. ViewStar Richmond condos are also just steps away from major transit routes (including the SkyTrain Canada Line), shopping, services, parks and the marina. This multi-generational Richmond property development will feature homes and housing types of all ranges. They will offer 1 to 4 bedroom condominium residences as well as townhouses. The prime Capstan Village Richmond location of ViewStar condos will be just minutes from Vancouver, Downtown Vancouver, YVR Airport, Richmond Centre, MacArthur Glen Designer Outlets and many other major shopping malls and world class dining. As well, there are numerous community amenities to choose from. Many of the homes at the presale Richmond ViewStar condos and townhouses will have stellar views of the water, mountains and city skyline. The homes will feature careful details and finishes that include air conditioning, parking for all units, engineered hardwood floors and much more. Residents at the ViewStar Richmond presales condos can also rest, relax and rejuvenate at the 35,000 square foot community centre, rooftop gardens and the future riverside park. For more details about this incredible opportunity to own a new home at Richmond ViewStar condos, please visit www.viewstar.ca or you can simply register your interest on this page. The project is brought to you by Yuanheng Developers and will be built in three phases. Live at the centre of it all in Richmond’s premier master-planned community. An urban sanctuary nestled in Capstan Village, ViewStar Richmond condos are just steps away from transit, shops, services, parks, and the marina. A prime central location only 5 minutes to Vancouver. Meticulously designed 1 to 4-bedroom homes and townhomes, with sartorial-inspired detailing and finishes. Stellar views of the water, mountains and cityscape. Rest, relax and rejuvenate at the 35,000 sq. ft. community centre, rooftop gardens, or future riverside park. Coming April 2017. Register now to receive the latest updates and news about ViewStar Richmond condos. 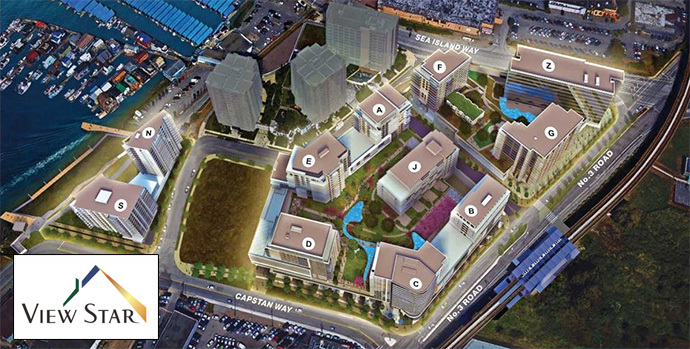 The master planned community at Capstan Village Richmond ViewStar will feature 1.3 million square feet of residential, retail and office space. There are a total of 10 residential towers (with a maximum of 15 stories) and they will be built and released for presales in 3 phases. Phase 1 at ViewStar Richmond condos will feature Buildings ‘B’ and ‘C’ and they will total approximately 81 and 110 condo units respectively with a range of 1 to 3 bedroom floor plans. Phase 2 at ViewStar Richmond will see the release of Buildings ‘A’ and ‘J’ for a total of 87 and 81 units for sale. The floor plans will range from 1 to 4 bedrooms plus approximately 8 townhouses. Buildings ‘D’ and ‘E’ will be released on Phase 3 of Richmond’s ViewStar development and will total approximately 79 and 99 units. These include 1 to 4 bedroom condominiums as well as approximately 5 townhouses. There are roughly over 500 homes for sale with an eventual completion at the end of 2019. In addition to the residential component of this master planned ViewStar Capstan Village development, there is also an office building with approximately 160,000 square feet of space. Retail space will also be added to the ground floor along No. 3 Road and Capstan Way. Most of the suites will feature in suite storage as well as storage lockers available for purchase. However, parking is included with all homes. What’s also exciting about the Capstan Village Richmond ViewStar condo development is the proposed Canada Line SkyTrain station which is adjacent to this community on the east side of No. 3 road. The amenities include a swimming pool, fitness gym, common meeting rooms and bike storage. Roof top gardens on the top of Parkade on the 4th floor as well as a brand new > 1 acre riverside park is also part of the master planned neighbourhood. In addition, the ViewStar Richmond community will add a brand new 35,000 square foot Community Centre. It will be located on the new East West road along Building G. Here, residents at ViewStar Richmond will find basketball, volleyball and badminton courts as well as multi-purpose rooms, meeting rooms, wet art studio, children’s exploration room and indoor walking track on top of a sports court. Other community highlights include the Vancouver International Airport plus outlet stores, Richmond Centre Mall, Costco and River Rock Casino.